Still disappointed that Bret Michaels was fired last week so unfairly. Trump really just had a bone to pick with him. He thought it was stupid for Bret to come back, but I totally get it. He wanted more money for his charity plus to be the winner of an All Star season would really carry weight… in the world of Reality TV where nothing really matters anyway. As usual, the episode starts off where last week’s ended… with the two remaining contestants from the boardroom (in this case Brande and LaToya) join the teams back at the suite and everyone acts like they’re all so happy to see them… and maybe some are. But there are a few who kind of threw Brande under the bus last week that should be a little worried now. Brande and LaToya explain to the teams why Bret was the one that got fired. Omarosa is gloating that she predicted this. Then Trump shows up unexpectedly and tells them they will be going on a private airplane, a 757, to go to Florida and Universal Orlando resort. Trace explains he will not be on this task. He booked a cruise over a year ago and he will be away doing that. Dee Snider steps up immediately to be project manager for his team as well as Omarosa for her team. She explains she’s playing for her late fiancee, Michael Clarke Duncan, for his charity Sue Duncan Children’s Center. Dee is playing for the charity Broadway Cares. Trump’s private jet is amazing and of course has his name plastered on the side of it. On the big screen TV in the jet, Trump delivers the task to the contestants. While at Universal Orlando Resort they will create a photo experience and will have access to the theme parks in order to capture amazing photos. Judged by the following criteria: 1) creativity of the photo experience, 2) integration of Universal’s marking campaign, and 3) guest experience. Winning project manager to receive $20k for their charity. Once the teams get to their space they meet with the Universal Executives that give them a few more details about their task. The Execs get done explaining it to the Power team and ask if there are any questions. Omarosa immediately says, “Mr Rodman has a question.” He says, “I do?” He was half asleep and she just called on him for no reason. Not sure what her motive was there. He finally asks a decent question, which is do they typically have celebrities in their promotional pictures. Their answer was no, that the characters are their stars and focus as well as the guests. With Dee’s team, the key take away was the they want to capture memories with a family. Omarosa’s team has decided to do three experiences that you can move from one to the next scenario with. So start with Harry Potter, end with Despicable Me, and they still have to figure out the middle one. She sends the team out to the park to capture pictures and has Dennis stay back with her. Dee decides that it needs to be celebrity driven. He wants cutouts of every single one of them lined up. His reasoning is that he hears on tasks often times, “you didn’t use your celebrity enough.” Penn disagrees and says you should do something that looks impossible and is memorable. He has the idea of having the mirror trick so it looks like people’s heads are just floating. It’s all illusion based. Stephen is skeptical of Penn’s idea and doesn’t think they have enough time to pull it off. Omarosa’s team goes out, takes pictures, and buys things for the photo experience even though they don’t completely understand Omarosa’s vision. The team is all trying so hard because they don’t want to go to the boardroom with her because they know she’s difficult to fight against. Dee’s team, Plan B, is still trying to figure out how to execute Penn’s idea. Meanwhile they haven’t taken any pictures yet. Omarosa explains her vision to the fabricators. She explained to them she wants people to walk into Harry Potter’s castle, and at the end walk out of Despicable Me’s house and in the middle have the big Universal Globe with Spider-Man hanging down. She wants them to create all of this. They’re all looking at her like she is crazy. Dee’s team finally goes out and takes pictures and acts all insane out there. Power (Omarosa’s team) comes back and they don’t have any Spider-Man themed things because she never told them to get it. On Dee’s team, he decided to abandon Penn’s ideas of using the illusions and instead go back to the celebrity cutouts. Gary Busey says, “It’s Simple. It’s as Simple as Making Soup.” The rest of the team doesn’t like the cutout idea but realizes the time constraints with Penn’s idea. The fabricators tell Omarosa that they just can’t complete everything in time. Something’s got to give. She acts very rudely towards them and tells them they need to get it done, that’s what they promised her. They’re telling her they just cannot do it with the time that is left. Dee gets paranoid because Stephen comes to him and whispers that he thinks it’s a good idea, keeping it simple with the cutouts. Dee doesn’t get why he’s whispering and what he’s setting him up for. Lisa Rinna and Marilu Henner are disappointed that it’s not 3D and they just don’t understand what it’s going to look like completed and they are concerned. Omarosa’s team gets to their display and it still needs some major finishing touches, but I have to say, it looks pretty awesome! To me, it’s already the clear winner. It features the different characters from the park, it’s interactive and 3D, and it just looks very creative and professionally done. Plan B’s team however, just has a royal blue background and the cutouts of themselves standing in front of it. Looks pretty pathetic, honestly. Penn points out the irony in having cardboard cutouts when the celebs are standing there for anyone to have their picture taken with also. Why would you want a cardboard cutout with a celeb when the real one is right there? With an hour left to go, my prediction is that Dee will be going home for this. So the experience begins with guests of the park and Eric and Don Jr show up to see how things are going. Their faces definitely say it all…. no smiles what-so-ever. However, over at Omarosa’s team they were able to get them to interact and really get in the middle of the experience. The two of them were all smiles. Don Jr was definitely looking as handsome as ever too, I might add. The Universal Execs then show up and Gary is being his usual clown-self. I think he frightened the women a bit. Then they went to Omarosa’s and they immediately say “wow! this is really cool!” Just like Eric and Don Jr, they got really involved and interacted with the scene and the celebs. Boardroom time…. Dee says his team’s idea was his (kiss of death) and that they all participated in the presentation of it. They all agree though that they liked him as a project manager. While talking about Omarose and her managing skills, Dennis Rodman reveals that nobody more nasty than his mom. His mom was tough, Omarosa is easy in comparison. Trump passes out pictures from the opposite team to each team to review. Omarosa notes that Dee’s team’s was very underwhelming. She was underwhelmed. Trump is about to announce who the winner is after going over what the execs had to say and he spends a good two minutes talking about his hair and if he should change it. He finally announces the winner by doing a fake out saying, “Congratulations to Dee…. your team lost.” Omarosa’s team wins and she breaks down crying. Just can’t get it together. She really is having a breakdown. This is the first time EVER she’s won as project manager. She’s so emotional because she was winning it for Michael Clarke Duncan’s charity and she’s had a very tough year with his passing. Now the next 20 minutes should be boring because nobody should go home except for Dee, as much as I like the guy. LaToya thinks that Omarosa is using this as a card to play in the game to help advance her. I have to say, as harsh as it is, I totally believe that as well. Omarosa’s reaction just seems very uncharacteristic and over the top to be completely authentic. Blah Blah Blah…. I’ll admit I was multitasking through that last 20 minutes. Dee Snider is fired. 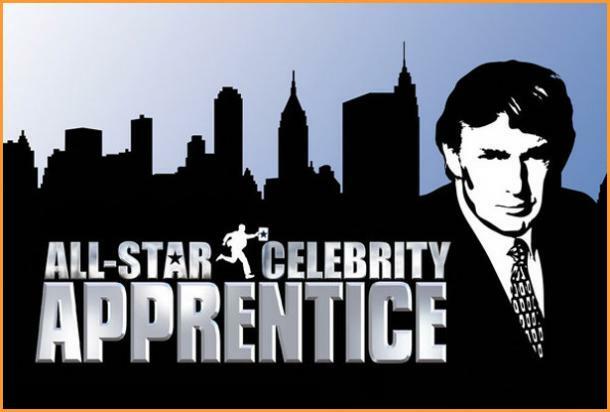 Posted by amandatalkstv on March 10, 2013 in Celebrity Apprentice All Stars and tagged Dee Snider, Lisa Rinna, Marilu Henner, Penn Jillette, Stephen Baldwin.